Follow the S5 or the S4 procedure below for connecting the Cosmo TPS to the FC Engine Harness. Banzai Racing Inc. is not liable for any damage or injury resulting from following this procedure. NOTE: The two Brown / White Stripe wires on the Engine Harness can be considered as one wire. You do not have to connect both of them. You can just connect one and cut back the other. The same rule applies for the two Brown / Black Stripe wires. 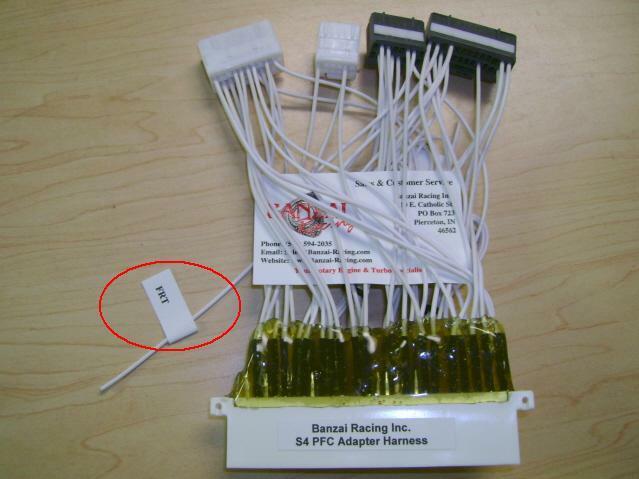 Connect the wire marked FRT on the Banzai Racing Harness Adapter to the Black / Red Stripe wire on Cosmo Connector (see pic below). You will need additional wire.